With Valentine's Day fast approaching, men and women alike are scrambling to find that perfect gift for their Valentine. Whatever you decide keep in mind that Valentine's Day should be a night of romance and surprises. 1. Naked/Body Sushi: We absolutely love this idea! Make his meal your lingerie, and if he does not like sushi then wear his favourite appetizers instead. 2. Burlesque Night Featuring YOU: Wearing lingerie on Valentine's Day can become a bit cliché, spice things up by putting on a burlesque show. He will certainly appreciate watching you dance seductively, while twirling those large feathers. (Burlesque feathers are available in most lingerie stores). 1. Giant Roses: A gift she will never forget! Tired of getting her roses every year? She will not be bored when you get her Giant 3, 4, 5 or 6 foot roses. 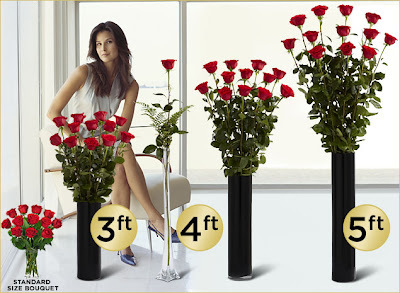 Yes get her roses as tall as she is or even taller! They'll cost you but they're worth it! The Giant Roses retail between $99 and $380, you can purchase them here . 2. A Cute, Cuddly & Adorable Pet: This is the gift that keeps on giving, get her that cute puppy or kitten. And rather than blowing the budget getting her that tiny toy, take the economical route and adopt a pet from your local pet shelter or humane society. Don't forget to take your valentine with you so she gets to choose her new furry friend. What will you be getting that special person this Valentine's Day? Will you be using one of our ideas? Leave a comment below. Fabulous, what a blog it is! This web site provides helpful information to us, keep it up.